Summer is in full swing over here and I've been spending a lot less time online. I miss the constant inspiration and feeling like I'm up-to-date on things, but honestly ~ it's been quite refreshing to just shut off the computer and slow down! It also has me thinking a lot (& frankly struggling!) about how to find the balance of being in the online world and the value of turning it off. I am the first to admit, I love what the internet offers ~ it's ability to connect like-minded people, the instantaneous resources available, the beautiful blogs, a source of new inspiration, the sharing of ideas and favorite finds, etc... But at the same time, hours go by in a flash. In an era where time is a most precious commodity, the internet can be quite a culprit in taking it away. It worries me how fast paced all of our lives seem to be these days and the enormous amount of information we are constantly being fed. How does one stay present with the never-ending flood of communication we both send and receive ~ emails, text messages, facebook, twitter, blog posts, etc...? Does anyone write a handwritten letter anymore, just because? Are our children going to know how to have a conversation in person or make a friend not on facebook? This is what I've been contemplating ~ a lot ~ and I think a huge part of why I love making anything with my own two hands. It slows me down and always brings me back to the present moment. It feels serendipitous that I stumbled upon this little book this summer, as finding the balance of the online and real world is constantly on my mind. I've only read the first few chapters ~ finding myself hanging onto practically every word Sarah Susanka says and wholeheartedly agreeing with the profound (yet simple) wisdom she has to share. 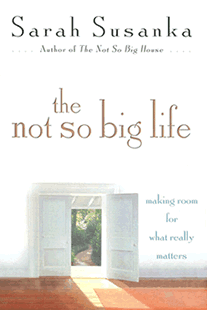 I do confess, it had me at the cover and tagline ~ The Not So Big Life ~ Making Room for What Matters Most. Sarah's philosophy is "that anyone can wake up from an overstuffed life to make room for what we long to have time for. It's possible to start living a life of full, rich, vivid moments where everything that happens to us is experienced fully, and where spirit and connection have room to thrive." If this is what living a Not So Big Life means, well then sign me up because I couldn't think of a more beautiful way to be in this world.